Battle Type Appearance Requirements At the start of the battle, send 2 cards containing the word 'Chosen' in their category from your hand to the Dark Area, and make this card appear from your hand. 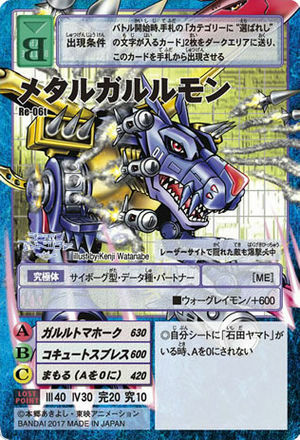 ■ Add 600 to the attack power of your War Greymon. ◎When you have an 'Ishida Yamato' card on your sheet, your A will not go to zero. This page was last modified on 1 February 2017, at 18:13.